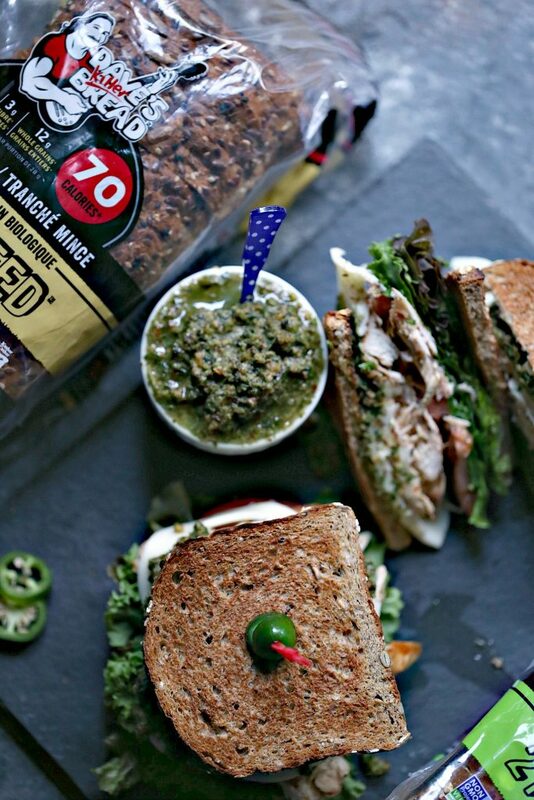 Grilled Chicken Sandwich with Basil Pesto is an easy recipe that will delight your tastebuds. 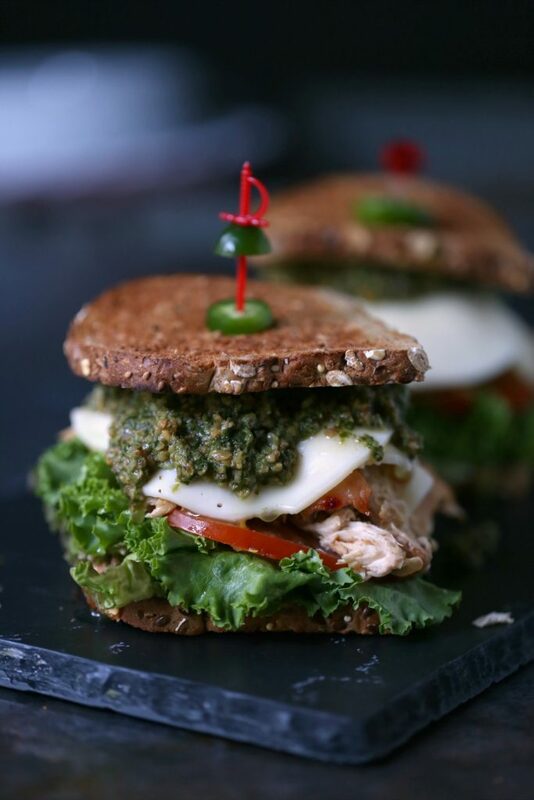 It’s piled high with vegetables, chicken, cheese, and pesto. 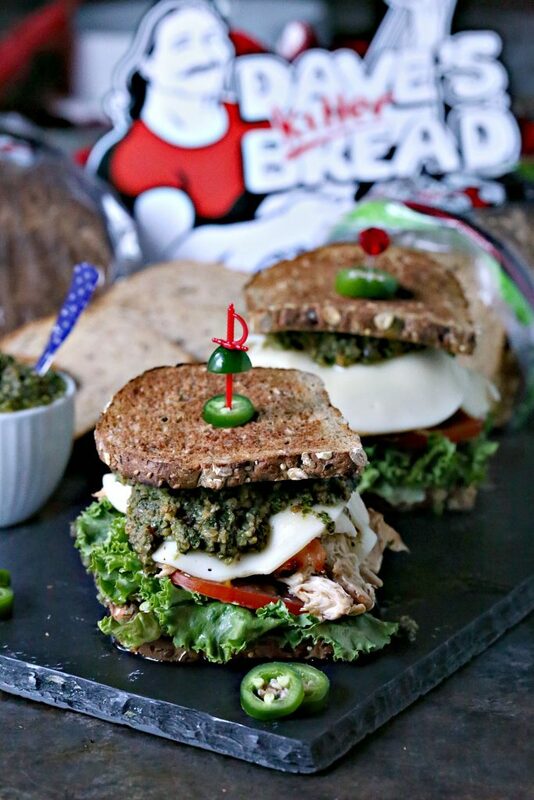 This Grilled Chicken Sandwich with Basil Pesto recipe is incredibly quick and easy to make. Lettuce, tomatoes, grilled chicken, provolone cheese, and basil pesto are sandwiched between slices of great quality bread. This recipe was sponsored by Dave’s Killer Bread. All opinions are my own, as always. Dave’s Killer Bread is a company I truly love. The brand has expanded into Canada, which I could not be happier about. If you’re looking for a bread that is “All Killer, No Filler” this is the bread for you. Dave’s Killer Bread Canada is powerfully different with killer taste and killer texture. It’s organic, non-GMO, packed with protein, fiber, and whole grains with no artificial flavours or colours. You can join the BreadHead Nation by trying out their bread! I’m so flipping excited I can find their bread here now. We’ve able to locate it in multiple stores in our area. Honestly, their bread is so fresh and such great quality. I think the ingredients make all the difference. I love the texture of all their bread but am super partial to the thin-sliced breads. It’s my absolute favourite for sandwiches. I knew exactly what I wanted to make for this post. Grilling is my jam all year long but in summer I grill every single day. One of my favourite things to make for lunch or dinner is grilled chicken sandwiches. A few years ago I made a Grilled Smoked Chicken Sandwich with Roasted Red Peppers, Mozzarella, and Red and Yellow Pepper Pesto for my grilling blog. We’ve been making various versions of that sandwich ever since. For this recipe, I decided to put a fresh new spin on it by using all the fresh basil I have on hand right now. 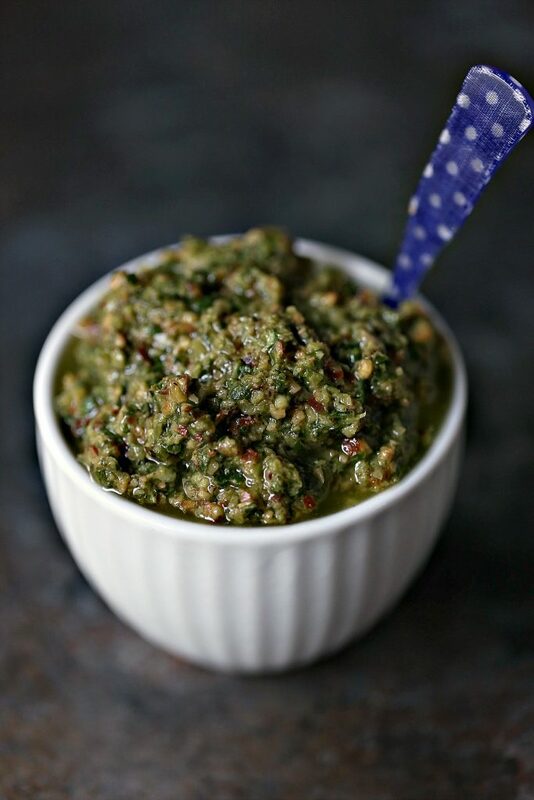 Basil pesto is incredibly easy to make and tastes out of this world. 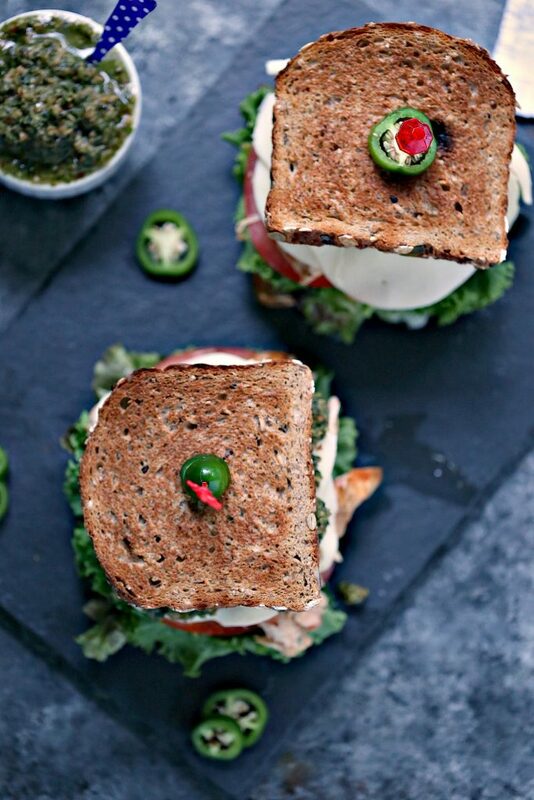 You can make this whole sandwich in less than 15 minutes. That’s pretty amazing for a sandwich with this much flavour. I used thin chicken breasts for this recipe but you could cheat and use rotisserie chicken if you like. No judgement here. I used my food processor for the pesto. If you don’t have one you can chop everything finely and mix it by hand. You could also pulse it in a blender if you had to. If you have a mortar and pestle that works too. 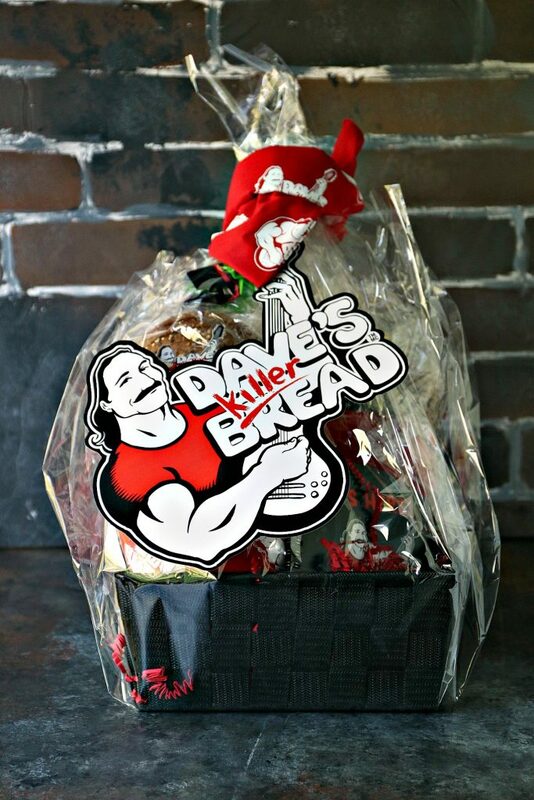 Whatever you do, make sure you use Dave’s Killer Bread. I used their 21 Whole Grains and Seeds Thin-Sliced for this recipe. You can use whichever one is your favourite. You can find all their products online. You can also find more information about their company in their about us page. 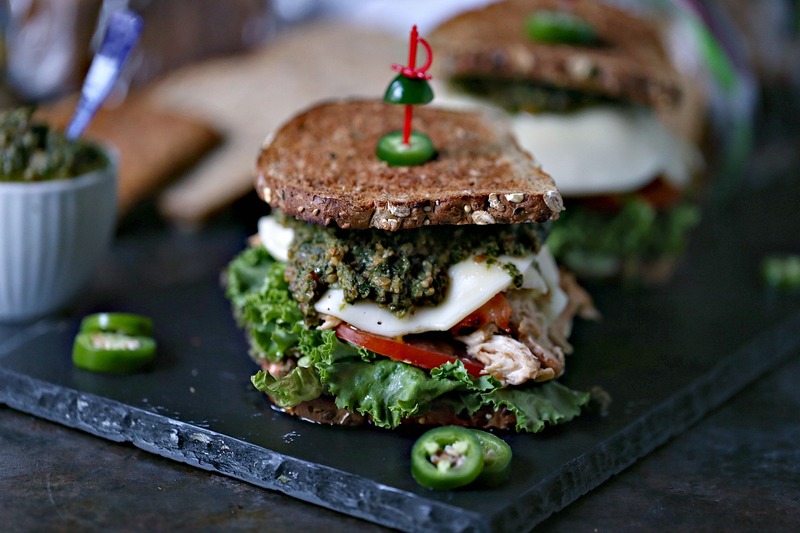 Now fire up that grill and make this killer Grilled Chicken Sandwich with Basil Pesto. I cannot wait to make this again and again! Places to stalk Dave’s Killer Bread Canada! Brush boneless, skinless chicken breasts with olive oil. Place over direct heat and close lid. Cook for 3 to 4 minutes on each side, depending on thickness. Using a clean brush, generously brush chicken with a some sweet chili sauce. Cook for 1 minute. Flip the chicken and brush other side with sweet chili sauce. Cook for 1 minute more. Internal temperature should be 165 degrees at the thickest part of the chicken. Remove from grill. Allow to rest for a couple of minutes the slice the meat or pull with two forks. In a food processor combine basil, oregano, garlic, red onion, almonds, parmesan cheese, jalapeno peppers, olive oil, salt and pepper. Pulse until desired consistency. Toast bread in toaster or on grill. Place 4 slices of bread on a large platter. Top each with lettuce, tomatoes, chicken, cheese, and pesto. Place top slices on each sandwich. You can garnish with sliced jalapeno peppers or pickles. Serve with a big old sandwich loving smile! 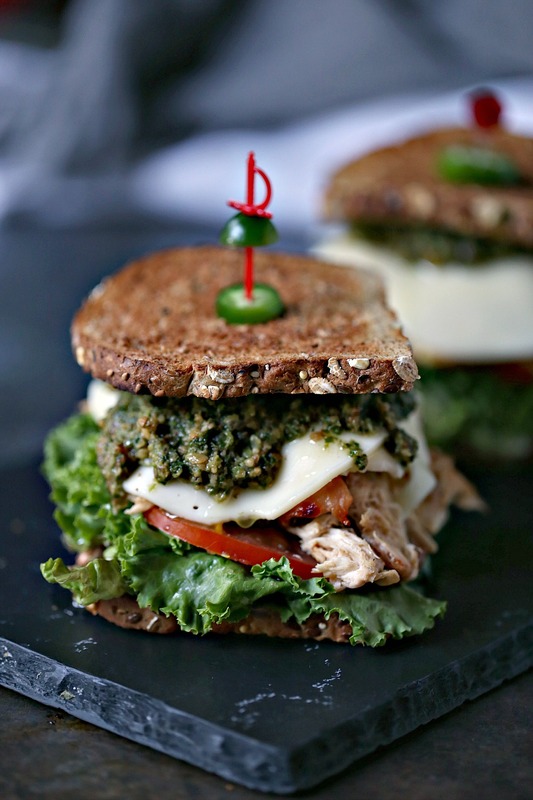 You need to make this Grilled Chicken Sandwich with Basil Pesto immediately! PIN THIS TO YOUR FAVOURITE SANDWICH BOARD! Check out my recipe index for more amazing recipes. 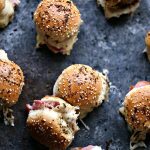 You can find more appetizer recipes and tons of snack recipes. I’m completely on board with the combo of chicken and pesto. Sooo amazing, especially for a sandwich! Thanks so much Paula. I appreciate it. You have taken the word sandwich to a whole other level!! 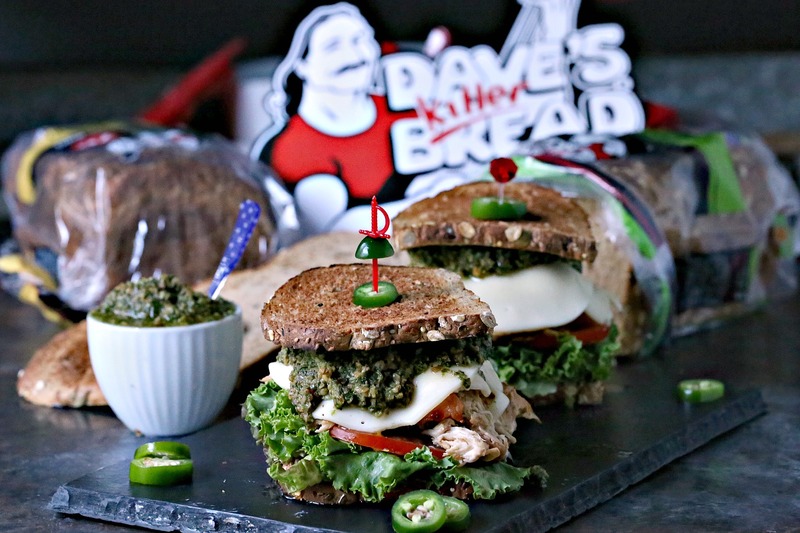 I never get tired pf pesto and I love Dave’s bread! Love this so much! Thanks so much Lauren. I had SO much fun working on this project. Such an amazing company to work with. I have been wanting to try that bread forever!! And there is nothing better than pesto! It’s SO good. I love their products. OMG I love the packaging, I’m off to find some of this fun bread! It’s such a great company and the bread is outstanding. This is definitely my kind of sandwich! Can’t wait to make it! Thanks so much Gina. Hope you love it. We love chicken and pesto! It’s such a classic combo. I’m a sucker for pesto, and chimichurri too.